Provides the ability to collect real-time data from facility infrastructure and IT equipment, providing operational insight into resource capacity planning as new customers are added (or deleted. Drawings of floor, rooms, cages and facility infrastructure are loaded into the DCIM Software creating a virtual data center for build-out planning and faster on-boarding of new customers. Enables better management of the data centre facilities by consolidating all the information needed to make smarter, faster decisions for infrastructure planning and the day-to-day management of hosted equipment. DCIM solutions automatically extract current energy usage and accurately display overall trending information. In many cases after deploying DCIM for monitoring, data center operators – for the first time – receive a holistic view of their entire energy consumption, coupled with a trending pattern to help spotlight areas of concern. Using a DCIM, data center operators can pinpoint where they have unused physical, power and cooling capacity, allowing these to be planned and optimized, without overloading or exceeding power, space or cooling limitations allowing the data center to be used to its full potential. Cutting energy usage will help Data Centre service providers save significant money and become more competitive. To reduce energy consumption, it must first be accurately measured. The measurement must start with a baseline view of what energy every part of the data center is actually consuming. And to be accurate, this view must include all areas such as IT equipment, power distribution infrastructure, and ventilation/cooling infrastructure. Without a DCIM this is an often time-consuming and manual data extraction process which is outdated and flawed. Since many data centers are designed with substantial redundancy to optimize uptime, availability and to handle potential peak loads that have yet to be experienced, there is substantial inefficiency built into the infrastructure. After implementing DCIM, many data centers are able to reduce their power consumption by 15-25 percent, or more. Power consumption data can be used to offer measured power billing to customers. Performance data collected by the DCIM can be used to verify Service Level Agreement (SLA) compliance. NetZoom reduces your costs through improved uptime by identifying potential outage risks before critical situations occur thus protecting your SLA’s. 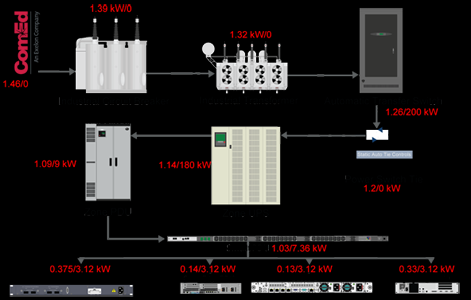 Operational costs are reduced by optimizing power consumption. Identifying and controlling space fragmentation and rack density postpones or prevents unnecessary and costly data center retrofits and build outs for your customers. Data center investment is maximized by redeploying underused, unused and ready to decommission devices. Operational efficiency is increased by effectively managing power, thermal and space capacity. Servers considered for virtualization can be quickly identified. IT and the facility infrastructure personnel can more easily collaborate and visualize data center resources and information. Troubleshooting time is reduced by knowing at the voices location and cabling layout beforehand. In addition, advanced monitoring, alerts management and detailed device change management logs reduce meantime to resolution when a problem occurs. What-if impact analysis enables capacity planning and control. User experience is improved by the simplification and automation of daily operational tasks and processes associated with managing a data center. Data center professionals are empowered to analyse problems efficiently through the use of advanced the dashboards, analytics, monitoring, and powerful alerts management. The ease of use of the NetZoom application empowers data center personnel and improves user experience overall. 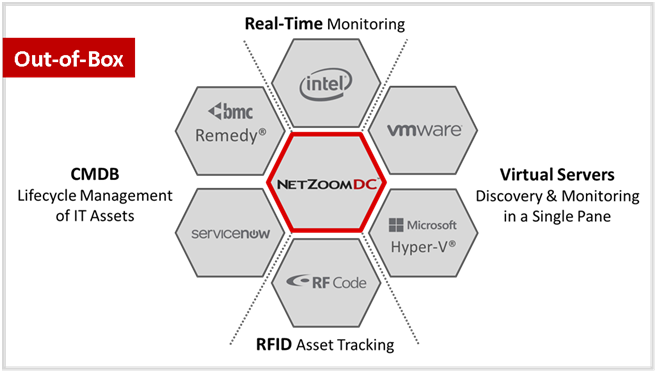 NetZoomDC is the most cost effective DCIM software solution on the market. NetZoomDC is full featured, providing all the features required for data center management including easy integration into other IT, BMS and workflow applications using the open schema and SDK. For additional details on this product and other data center services available from Tri-Paragon Inc. please contact us by email at info@triparagon.com or by calling us at 416.865.3392. Please view our website at www.triparagon.com. Download our Data Centre Products and Services Brochure by clicking the button below.